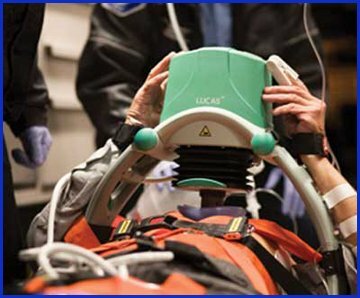 The LUCAS Chest Compression System is designed to deliver uninterrupted compressions at a consistent rate and depth to facilitate ROSC (return of spontaneous circulation). It delivers automated compressions from first response in the field to ambulance transport and throughout the hospital. LUCAS facilitates consistent blood flow from the moment it is turned on, helping to improve a patient’s chance for a successful outcome. With LUCAS, defibrillation can occur during ongoing compressions that can prime the heart for a successful shock. Also continuous compressions help maintain coronary perfusion pressure needed to facilitate ROSC. 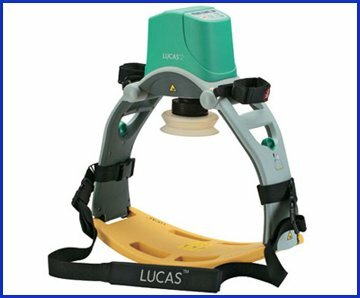 You now have the choice between an air driven and battery powered LUCAS device. The original LUCAS 1, is a pnuematically-driven device and requires no electrical supply for operation. It is powered by compressed air from a portable compressed air cylinder or wall outlet. LUCAS 2 runs off of Lithium-ion Polymer battery technology, which has a long shelf life and requires no test-cycle maintenance. Both devices are equally easy to use and are designed to deliver uninterrupted compressions at a consistent rate and depth to facilitate ROSC. Enable the intervention to continue in the event of a cardiac arrest in the cath lab by providing consistent, guidelines-quality chest compressions, which facilitates blood circulation to supply oxygen to vital organs.